Morgan Earp was an approximate middle child of the Earp family. He was born on April 24, 1851 and named Morgan Seth. His parents, Nicholas and Virginia Ann were living on a farm in Pella Iowa at that time. He had an older half brother, Newton. His older brother James was 10 years his senior. Virgil was 8 years older and Wyatt just about 3 years older. An older half sister, Mariah Ann, died in infancy before Morgan was born. Morgan Earp didn't seem to create too much of a stir, as did some of his other brothers. Was he overshadowed by them, as they created more headlines? Unfortunately his renowned newspaper fame came along at the end of his life. While there in Iowa, they were again settled into a farming environment. For a good deal of Morgan's childhood, his parents lived on a farm. He was expected to help with those chores typical of agrarian life. James was wounded and returned home in 1863. Nicholas Earp then decided to join a wagon train in the spring of 1864. They headed for California. He packed up the family: James, Wyatt, Morgan, Warren and Adelia - along with wife, Virginia Ann. Nicholas was to lead the trek. They arrived in the San Bernardino area by the end of the year. Nicholas rented a riverside farm about six miles East of town. While in his mid teens, Morgan moved with his family again. This time to Lamar Missouri. Only his brother Warren and sister Adelia now lived at home along with him. Nicholas Earp became the town Constable.3 Towards the end of 1869, Wyatt was back home with the family. At that time their father resigned as the Constable to become a Justice of the Peace. Wyatt took his place as Constable.4 Morgan Earp was now 18 years old. In his teens Morgan began looking to the life his brothers led. They roamed the West. They had adventures that to him looked more exciting than the farming life of his father. When a teenager, he may have first went with James on a trip to Montana.16 It's probable that he worked alongside Wyatt as Stagecoach line security. All his older brothers had that experience. By the way - so often in news reports of the day, they don't get the spelling of the "Earp" name correct! Louisa had been stricken with a disabling chronic disease. Rheumatoid arthritis made it difficult to tolerate the cold conditions in Montana. No doubt that's the reason for their move to the California family home.7 Now settled in, Morgan began to hear of other options. Louisa had written that they needed a way to earn a living. Morgan must have perked up his ears to what his brothers were saying about Tombstone AZ! Virgil Earp was hired to be deputy U.S. Marshal under Crawley Dake for Arizona Territory. He liked to keep things in the family. So he'd put his brothers on as deputies when needed. Morgan Earp was a man for the job, and assisted Virgil quite often. However, Morgan was noted as a member of the Earp family by the group of local ranchers known as the "Cow-boys." The County Sheriff, John Behan, was friendly to this group. Many of the town-folk also got along well with them. One of the local newspapers supported them. So the Earps were at odds with this faction - the Cow-boys. Nerves went on edge when Virgil and his brother deputies enforced the law, as they saw it. 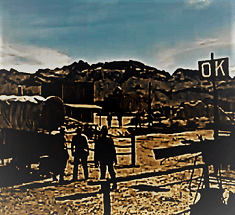 In December of 1880 Louisa joined Morgan in Tombstone. She stayed a few months, and then returned to California. She told her sister that Morgan's parents didn't even think she should go to Tombstone at all. She relented and returned to California early in the new year.9 Soon thereafter, Nicholas moved the family to Colton, California - just outside San Bernardino. Morgan got along well with Wyatt's good friend, Doc Holliday. They often gambled together. A lot of times, gambling games involved the Cow-boys as well! On occasion, though, tempers would flare - especially when Doc felt wronged or insulted. Stagecoach robberies in Cochise county increased during late 1880 and early 1881. Morgan was in on the posse that searched out robbers of a March 15, 1881 hold-up of the stage to Benson. They didn't find the culprits. But rumors spread, and the Cow-boys implicated Doc Holliday. Some said the Earps were in on some of the stage robberies, too. The Earps didn't take these accusations well! Of course, they were totally false. Two families who ranched in Cochise County, and were known as Cow-boys were the Clantons and the McLaurys. "Old Man" Newman Haynes Clanton was the father to five sons and two daughters. The sons primarily associated with the Cow-boys of Tombstone AZ were Ike and Billy. They had a ranch near the San Pedro River, at Lewis Springs. The Clantons and the McLaurys were friends with John Ringo, Curly Bill Brocius, Pete Spence, Frank Stilwell and Billy Claiborne. The Clantons and McLaurys were discovered with suspicious cattle brands at times. The Earps confronted them on a number of occasions. They often had strong words for these Cow-boys. Then at times they all seemed to cooperate when it was to their advantage. Bad blood reddened further in mid August 1881. Virgil Earp led a posse, chasing down some cattle rustlers. Just over the Southeastern Arizona border, into Mexico, Old Man Clanton was killed on August 13 over a cattle dispute.6 The slayers were Mexican ranchers, but some say it was the Earp posse. Led by Virgil, it included Warren Earp and was thought to include Morgan. Later - check in at the poker game at the Occidental Saloon. Seated are Cow-boys Ike Clanton, Tom McLaury and their Sheriff friend Johnny Behan. Also in the game are Virgil Earp and one other player - some think it may be Morgan Earp.6 Quite a mix! The game goes on til the early morning. At about 6 a.m., Ike begins mouthing off to Virgil that he aims to take care of that Doc Holliday. Virgil tells him to go home and sleep it off. But he doesn't. He wandered Tombstone streets on October 26, 1881, still drunk. He told everyone in earshot how he planned to take care of Doc and the Earps. He was armed - not allowed in town! Virgil was home sleeping. He woke up and found out what Ike's been doing. He got Morgan and they corraled him and took his guns. Virgil clunked him on the head and took him to court where he was fined. In the courtroom, while waiting for the judge, Ike continued his tirade at the Earps. They "fired" back! Morgan told Ike he'd give him his six-gun so they could shoot it out now!16 Of course he was using sarcasm. But Ike certainly didn't cool down. Wells Spicer headed the hearing to assess the evidence for a trial. After 31 days of witness statements Spicer gave his decision. He found the Earps and Holliday were lawful since it was a required action to do their job. A Grand Jury about two weeks later came to the same conclusion. But it was not a popular decision with many in Southern Arizona. One initial event gave foreboding of what was to come. John Clum was the editor of The Epitaph, which gave full support to the Earps. He, as well as Spicer and the lawyer who defended the Earps and Holliday all received a threatening letter from someone called "A Miner." It warned each to leave town, and if not it hinted they may be shot. The Earps realized their families could be in danger, as well. Virgil, Allie and Morgan moved into the Cosmopolitan Hotel on the North side of Allen Street, at the corner of 4th. Wyatt also took a room there, but his common-law wife, Mattie Blaylock Earp, stayed behind in their home. 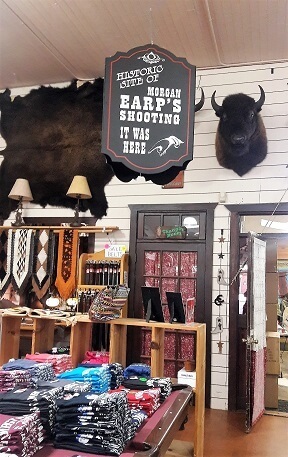 Probably because Wyatt had begun distancing himself from her at this point.17 The Earp brothers' change in location was a wise move, but didn't ward off all dangers. On December 28, 1881, Virgil was in the Oriental Saloon. It was late and he went out to make his way home. Halfway across the street, between the Oriental and the Golden Eagle Brewery, Virgil was hit by gunfire from a shotgun. A witness heard four shots that came from the upper floor of the building on the Southeast corner of Allen and 5th. Virgil was hit in his left arm, shattering most of his elbow. Another hit him in the back. Wyatt telegraphed Marshal Dake, Virgil's superior, to notify him. The Weekly Arizona Miner wrote "the Earps have received, almost daily, anonymous letters, warning them to leave town or suffer death..."16 The January 1882 city elections reemphasized to the Earp brothers where they stood in town. Those candidates supported by The Nugget were almost all elected. Regardless of that circumstance, the Earps were able to get a warrant to arrest suspects. Wyatt gathered a posse with seven men, including Morgan. They began an investigative search on January 23rd. Two days later, 30 were in Wyatt's posse that left town to pursue Virgil's attackers. They nearly ransacked Charleston where the Cowboys also hung out. Their local perception was not improved! On March 18, 1882 Morgan took in a theater performance at Schieffelin Hall. It was a Saturday evening out along with Doc Holliday and Dan Tipton. They saw the opening of "Stolen Kisses" by the Lingard Company. Then Morgan and Dan went to Campbell and Hatch's Billiard Hall and Saloon to shoot some pool. The billiard room was located toward the back. Morgan walked to the table and started up a game with Bob Hatch. Wyatt was in there along with their friend, Sherman McMasters, and George A. Berry.17 They all watched the game. The back wall had two windowed doors situated on either side. An alleyway was outside those back doors. Morgan Earp's Killing Was Right Here! McMasters and Hatch ran through the doors. They searched the alley behind the saloon, but didn't find the culprits.17 A few physicians were right in the area. Dr. Goodfellow was nearby and ran to see what happened. They turned Morgan over to examine him. It didn't look good! Everyone tried to stand him up, so they could bring him to the card room. As they did, he said his last words: "Don't, I can't stand it. This is the last game of pool I'll ever play." They got him to a lounge in the card room. Dr. Goodfellow saw that there was no hope. By now the rest of the family were there. Virgil and Allie, James and Bessie, and Wyatt were at his side as his life dwindled away. Before the hour since the bullet entered his body had ticked by, Morgan was gone. His wounds were fatal. Dr. Goodfellow's report showed the bullet went from the left of the spine across to exit on the front right. It perforated his left kidney, damaged his vena cava (the large major vein bringing the body's blood back to his heart - this would cause a lot of blood loss fairly quickly), spinal cord and gall bladder. From Contention to the connection in Tucson, Morgan went home for burial.The next day, Monday, more family members began to follow the route to the family home. Virgil and Allie were taking the train from Contention to Tucson, switching there to the train to California. They ate their meal and left. Virgil and Allie boarded the train. Wyatt spotted would-be assassins Ike Clanton and Frank Stilwell. He shot at them and Stilwell was found dead the next morning. Wyatt Earp's Vendetta Ride was in full force! Morgan Earp did not quite reach his 31st birthday when he was murdered. Whatever role he played in the Cow-boy/Earp feud, that is too young to die. The whole event was certainly a sad situation. He has now lived through the years - in infamy. As did all the others who were involved in the gunfight that day. In the life of Morgan Earp there were many unfulfilled days yet to experience. Morgan was first buried in the original Colton town cemetery, near Mount Slover. This cemetery was relocated in 1892. 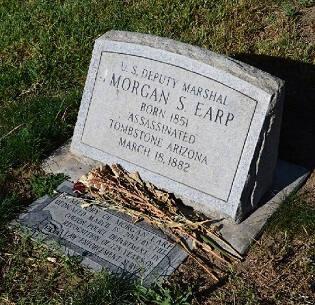 Morgan Earp's body was then re-interred in Colton's Hermosa Cemetery. 4 Barra, A. (1998) Inventing Wyatt Earp: His life and many legends. New York, Carroll & Graf Publishers. 10 Aros, J. (2011). The Cochise County cowboys: Who were they? Goose Flats Graphics. ISBN 0982596340. 11 Bailey, L.R. (2004). Too tough to die: The rise and fall of a silver camp; 1878 to 1990. Tucson, AZ: Westernlore Press. 13 Arizona: Attempted assassination. (1881, December 30). The Record-Union. Friday, Page 3. Sacramento, California. 14 Brown, C.S. (2003). Tombstone from a woman's point of view. Compiled & edited by L.R. Bailey. Second edition. Tucson AZ: Westernlore Press.